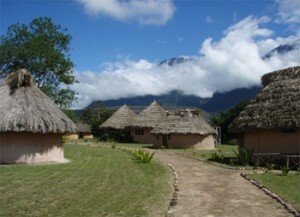 Uruyén Lodge was built specifically to receive tourists; the Carballo family of the Kamarakoto tribe operates it. The lodge, situated in a savanna ecosystem deep in Canaima National Park is only accessible by small plane or many days walking! And what a flight to get there! Flying over Lake Guri, tropical rainforests, jungles and the world’s tallest waterfall – Angel Falls at 979 metres (3,212 feet tall). Not to mention some of the 160 majestic tabletop mountains that tower above Canaima National Park. The recommended stay here would be for three of four nights however it is a good starting point for other destinations in Kamarata Valley (Kavak, Kamadak and Kamarata) as well as a couple of the longer tours that Angel-Eco Tours has to offer by land and river to Angel Falls and Canaima Lagoon. Also Uruyén is the last stop before accessing the only route available to trek to the top of Auyántepui (a six day excursion to the summit and back). Activities include hiking, trekking, cultural visits / dances, swimming and visits to local waterfalls dotted around the area. Angel-Eco provides tours in particular that retrace Ruth Robertson’s “Forgotten Expedition” all the way to Angel Falls to and from Caracas and of course featuring this pristine location in the middle of serenity!